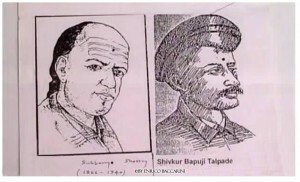 by Enrico Baccarini – One of the most interesting situations emerged in the Vaimanika story are the events related to a man named Shivkar Bapuji Talpade (1864-1916) a Maharashtrian Pathare prabhu community member who purportedly flew an unmanned airplane, named Marutsakhā, from “Marut-Air or Stream of Air, Sakha Friend”, as said of Sarasvati in RV 7.96.2. Talpade lived at Dukkar Wadi (now renamed Vijay Wadi), Chira Bazaar, near Mumbai (Bombay). He was a scholar in Sanskrit literature and Vedas. Thanks to the help of Pandit Subbaraya Sastry, the man who gifted to the world the Vaimanika Shastra, Talpade constructed the Marutsakhā and managed to take off it in the Mumbai’s Chowpatty beach in 1895. We remember that the first unmanned heavier-than-air flight was John Stringfellow’s in 1848 but the real first man flight was Wright’s brother of 1908. 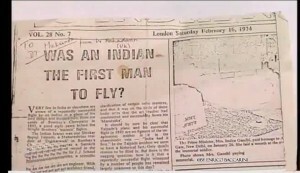 The Talpade’s work could be considered, however, the first Indian flight. Still today there are conflicting data if the plane really flew but we know that some newspaper of this period spoke about this experiment and of an half success of Talpade. As we said before Talpade constructed his models under the guidance of Pandit Subbaraya Shastry, the author of Vaimanika Shastra. This information is present also in Shastry’s autobiography where he speak also about of his friendship with the same Talpade (whose are devoted several pages) and with the scientist Chandra Bose. In 2004 The Times of India, quotes former principal defence scientific officer, D. H. Bedekar, as saying that, “Mr Talpade’s plane for some technical reasons failed to operate to its full design limits“. The article also speak about a scholar, Velkar (1997), which quotes one of Talpade’s students, P. Satwelkar, as saying that “the unmanned plane flew a few minutes and came down“. In his work Velkar (1997) found also that Talpade studied the achievements of aviation pioneers like Hiram Maxim and “[Thomas] Alva Edison who flew in a balloon and survived a mishap in 1880”. Velkar quotes one of Talpade’s nieces, Roshan Talpade, as saying the family used to sit in the aircraft’s frame and imagine they were flying. A model reconstruction of ‘Marutsakha’ was exhibited at an Expo on aviation at Vile Parle, and Velkar refers to “some documents relating to the experiment” that are preserved in the Hindustan Aeronautics Limited of Bangalore. Until today no one has found them. We don’t have many historical informations about this man and his work but for Vaimanika.com we are working and looking for new materials that soon we’ll be publish!! !